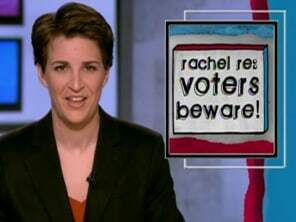 Nov. 3: Rachel Re: Whatever misconceptions you hear about voting, one thing is clear -- vote November 4th, and don’t listen to anyone who tries to tell you otherwise. Oct. 28: Gov. Sarah Palin has quoted former Secretary of State Madeleine Albright on Sen. Barack Obama's readiness to lead. Albright joins The Rachel Maddow Show to set the record straight. There is bad news and good news this election eve. The bad news? There is a crime wave going on. People are trying to steal from you as we speak. Steal. Rob. Burgle. Pilfer. Abscond. That's the bad news. The good news? Unlike most arch-criminals, these thieves can be stopped -- if you ignore them! Can you imagine if Batman could have just ignored the Joker? Holy simple solution! Well, what treasure do today's thugs want from you? They want your vote. They want your power. Anyone who tells you that you can vote by phone in this election? Is lying and trying to steal your vote. You cannot cast your vote by phone. Anyone tells you that you are risking arrest for traffic tickets or outstanding warrants by turning up and voting tomorrow? Is lying and trying to steal your vote. You will not be arrested at your polling place. Anyone who tells you that you are expected to show up to vote on Wednesday instead of on Tuesday to vote because of high expected turnout or something? They are lying to you and they are trying to steal your vote. The last day to vote is tomorrow, Tuesday. If anyone threatens your college financial aid, or tells you your parents will not be able to claim you as a dependent on their taxes anymore if you vote where your college is instead of where your parents live? Say it with me now: They are lying to you and they are trying to steal your vote. The Supreme Court has affirmed that college students have the right to vote where they go to school. In an ideal world, candidates would each try to persuade the largest-possible number of Americans that they'd be the better elected official. Whoever persuaded more Americans to their side, would win. In the real world, there's a whole lot of hullabaloo and holy-baloney that gets in between us deciding who we want to vote for, and our votes being cast and counted! First, it's the voter registration purges, with election officials looking to produce the smallest-possible roster of eligible voters, kicking people off the voter rolls for squinting in their I.D. photo or whatever. Then, it's the allocation of voting machines and poll workers and the restricted polling-place hours to ensure that you have to be able to afford to wait in line a reeeeally reeeeally long time, if you want the privilege… I mean the RIGHT of casting that precious ballot. Voters in Virginia have been getting flyers with the seal of the commonwealth of Virginia on them, the letterhead of the Virginia state board of elections, telling them that if they're planning on voting for a Democratic candidate, they should show up the day after election day. Robocalls in the Pittsburgh area are telling voters the same thing. Voters in Broward County Florida have been getting calls that sound like they're from the county elections supervisor inviting them to vote by phone instead of at the polling place. It's the same thing in Nevada, where Latino voters are being targeted with the same vote-by-phone scam. At Drexel University in Philly, there are flyers warning students that voting would cause them to risk arrest at the polling place. Here's what I think about this anti-democratic steal-your-vote screw-the-heroes-who-died-for-this-right underhanded cowardly sniveling illegally-intimidating-and-misleading-voters unpatriotic anti-American bullpucky: I'm not crazy about it! And since it's illegal, and since it happens to a greater or lesser degree in every election, it would be nice to see this stuff get prosecuted every once in a while. In the meantime? We can all fight back by not being intimidated, not getting tired, not letting the obstacle course they're making you run through keep you from exercising your right as an American to participate in this big group decision we call democracy. After eight years of perhaps the most incompetent government in American history, we've got one way to fix it now... one way to exchange a president who is more despised by his own people than any other president in the time that polls have existed. Choose who you will, but don't give up the power to choose by letting anyone — or anything — keep you from voting. Got a tip about the oil spill investigation?